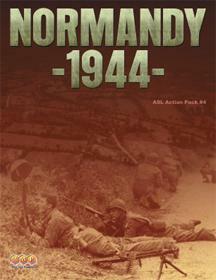 ASL Action Pack #4 - Normandy is a scenario bundle featuring the battles in Normandy, France. The scenarios represent actions on the Western Front from D-day through the breakout, with three new ASL geomorphic maps (53, 54, 55) that feature the terrain that caused the Allies such problems - hedgerows. Action Pack #4 - Normandy is sure to be enjoyed by veteran ASL players.